The new Merritt pellet plant is designed to accommodate four pellet mills, but has started operations with two, meaning they will be aiming to achieve initial production of 60,000 tons per year. Bio-energy has been identified by the forest industry as a way to tap into the economic potential of the growing bio-economy, and two new pellet plants in B.C. and Ontario expect to be doing exactly that. Owned by the same group of investors that includes Ontario entrepreneur Charles Pitcher and Vancouver investor Jason Birmingham, both the Highland Wood Pellet plant in Merritt, B.C. and the Woodville Wood Pellets plant in Kirkfield, Ontario have the potential to produce about 120,000 tons of wood pellets per year. While each plant is designed to accommodate four pellet mills, each will begin operation with two, which means that they will initially aim to achieve 60,000 tons per year. The Merritt plant is now operating and the goal is for it to reach full production by August to meet market demand for the upcoming heating season. The Kirkfield plant is slated to begin operation later this year. Since wood pellets represent an alternative to fossil fuels and produce fewer greenhouse gases, the federal, Ontario and B.C. governments have enthusiastically supported the ventures. For example, the Merritt plant received $2.45 million in federal funding through the Community Adjustment Fund, which is assistance provided to communities with populations under 250,000 that have seen key industries suffer due to the recent economic downturn. Project financing was also provided in B.C. through the Business Development Bank of Canada. The Woodville plant in Ontario received the first licence ever granted to an Ontario wood pellet producer through the Ministry of Natural Resources for fibre procurement on Crown land. Municipal governments demanding the construction of more energy efficient buildings, pressure on automobile manufacturers to build more environmentally-friendly vehicles, and the trend toward greater investment into the transitional or alternative energy fields—even among big oil companies—are all positive trends favoring the wood pellet industry. Government leaders are also encouraged by the number of new jobs that this industry can provide. The Merritt plant will provide about 50 jobs at the plant and in off-site fibre procurement and transportation, and about the same number of jobs will be created in Kirkfield. Both plants are strategically located so that they are reasonably close to their fibre supply, large domestic markets as well as shipping ports, says Nagy. The Merritt plant is making use of the growing volume of shavings and sawdust being generated by five major sawmills in the surrounding area. Transportation of the wood residuals from the sawmills to the pellet plant is only about two kilometres, on average. Shavings and sawdust—raw material for pellet manufacturing—is stored on site in a large covered building about the size of a football field. The material must be no more than 15 per cent moisture content for pellet manufacturing. 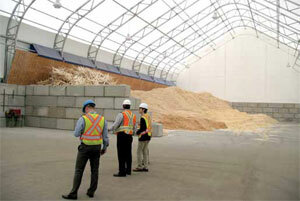 The Kirkfield plant will use hardwood chips from various sawmill operations in a 75 kilometre radius from the plant. The company has negotiated long term fibre supply agreements with surrounding sawmills and it pays for the material. Sawmill suppliers transport the raw material to the pellet mill sites. The raw material is stored on site in a large fabic covered building about the size of a football field. It must be no more than 15 per cent moisture content for pellet manufacturing. The plant design and machinery selected are similar for both pellet plants. To manufacture pellets, the raw material is transported from storage as needed from the fabric covered building’s infeed table, using a series of conveyors that lead out of the building and into the pellet plant where the material is dropped into a Jeffries hammer hog. Here the material is reduced to one inch in size or less. After the hammer hog, it proceeds to a Chinese-built Mujang hammermill where it is further reduced in size to 7 millimetres. “At this point, the material is ready to make a pellet,” says Marler. 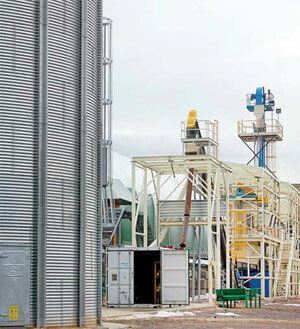 The material is then conveyed up a bucket elevator into a silo capable of holding 285 tons of material. 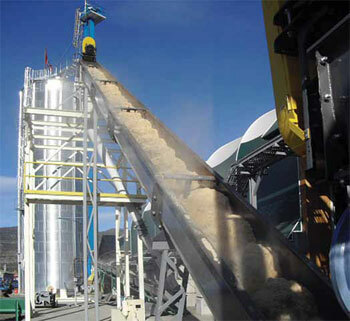 Material from the silo is fed into a German-manufactured Münch pellet machine, and then into two coolers provided by Mujang. The pellets then enter the bagging line that begins with a Mujang shaker screening process to remove fine particles from the pellets, and then into an automatic bagging line that is capable of bagging 10 bags per minute. It was supplied by Pacepacker. The bagged pellets are stacked on skids and are now ready for shipment. The entire line was designed and equipment supplied by UAS Canada, located in Abbotsford, B.C. and is fully automated. Staff are primarily involved in handling the raw material, product bagging, and plant maintenance. The mobile equipment used in the yard to transport the raw material and finished product are a John Deere 304 front end loader and a Toyota forklift. The pellets are shipped to market by truck. The company is in the process of installing Grecon Spark Detection systems in their pellet mills. Nagy describes the current market for pellet supply in the West as “crowded” due to other pellet producers coming on stream since construction began at the Merritt plant. But he added that on the positive side, the export market for wood pellets is more or less booming. The Kirkfield plant is about an hour from the large Toronto market as well as from shipping ports located on Lake Ontario. The economics of plant location is definitely a balancing act, Nagy says, between close proximity to fibre supply and major markets. He adds that while fibre procurement is important, investment in the industry is definitely market driven. 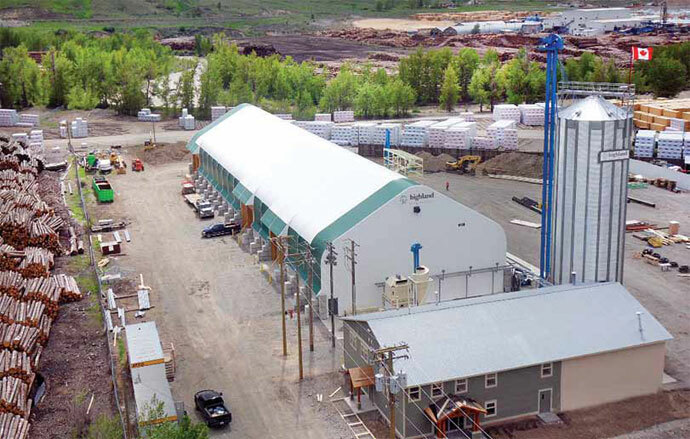 The Merritt wood pellet plant is making use of the growing volume of shavings and sawdust being generated by five major sawmills in the surrounding area, many of which use beetle killed pine to produce lumber. Ontario’s decision to phase out power generation using coal and move to using wood pellets as a replacement fuel is something Nagy described as having huge potential. However, the economics are another question. Of the three main energy markets for wood pellets—domestic bagged product, the export market, and co-generation in utility power plants—the latter has the thinnest profit margin. “Is it a strategy? Well, yes, it’s a fall-back strategy. Are we interested in that kind of volume? Well sure, it depends,” says Nagy. The market for wood pellets has been subject to considerable price volatility, influenced significantly by freight costs and the price for fossil fuels such as oil and natural gas. Nagy emphasized the importance of having a diverse marketing strategy not just in terms of marketing wood pellets, but supplying wood pellets for uses other than heating and power generation. He adds that the reason why company owners decided to invest in the pellet plants in the first place was that they saw some underserved markets. Ontario is the fourth largest area for equine activity in North America with about 380,000 horses and Calgary and B.C. together have over 100,000 horses. Through a diversification strategy like this, Nagy notes, other existing pellet plants have been able to continue operating when the energy market has yielded little profit. There is no difference in the attributes of pellets produced for the heating or equine markets and the goal is to produce about 80 per cent for heating and 20 per cent for equestrian use. 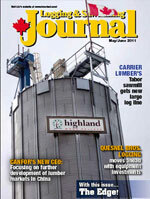 The cost of natural gas and crude oil has a huge influence on demand for wood pellets. According to the Pellet Fuels Institute in the United States, each time the cost of crude oil increases, marketers of pellet appliances increase their sales by 20 to 30 per cent. While natural gas is currently relatively inexpensive, Nagy says there is great uncertainty as to what direction it is headed because the influence of a sudden abundance of supply from shale formations is so far unknown.